We kicked off the Soccer Season by Kicking. After that it Was a day full of Blown expectations! Captain America registered this year? Who knew! 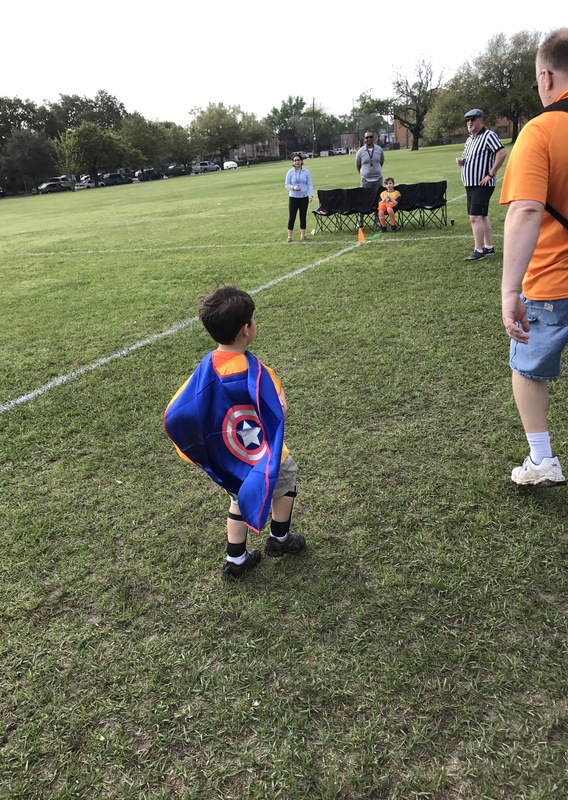 Well Not everyone wore capes Saturday but all participated like super heroes! Starting with the coaches and players for the Hawks vs the Falcons game. Both teams passed the ball between teammates at least 1 or 2 times before kicking a combined total of 9 goals! And with sideline shouting like the following,Coach Bobga made sure the golden rule was never substituted during a rotation. “No! High Fives and “way to goes”…give to the other team, ” Coach Katy clarified. The Cougars vs. The Cheetahs. From the opening kick to that weird but awesome parent tunnel thing, the fans purred watching simply fantastic feline Fútbol! Should we have expected less? Not with these Two coaches headed for History. Wardell Wade. There is a capital letter and punctuation. Now That’s a sentence. The Tom Landry of SWBC soccer. Jimmy May. Enough said as well. 1st year in our league and his only rookie mistake was letting some fan take my seat on the team bench and use all my sunscreen. Oh well-his future is so bright she will need to share. Rookie of the year? We had a mid game devotion from Micah 6:8 about being fair, kind and humble in all that we do…and well…everyone was. Thank you God for a wonderful season opener. Jerseys come in this week-uniforms not cows. Staring at this game may cause temporary blindness. What a bright start to the season. From the opening kick to the final whistle – the Sparks set it on fire and the Diamonds shined like sun. This game burned with so much intensity it’s now listed as evidence for global warming. As they say… it’s all over now but the Aloe Vera. How do you know when the Tornadoes and Dynamo just played? All the sirens are set off and power won’t turn on… thankfully the Dynamo generated enough electricity – no one even noticed. All players were plugged in and determined to blow spectators away from the opening prayer to the closing parental tunnel run through thingy. If you missed it make sure to get the straight to DVD surprise blockbuster starring these two teams – DYNADO! Jesus Is The Lord!